Please send me more information on Fitness Services: Moduvated! Prepare for an incredible workout meant to strengthen and reinvigorate. 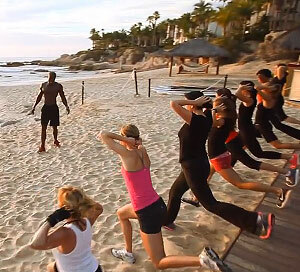 Modu Seye, the owner of ModuVated, inspires and nurtures his clients, teaching fitness as a way of life. Modu holds certifications in NASM (National Academy of Sport Medicine), NESTA (National Exercise & Sports Trainers Association) and TRX™ group fitness training. ModuVated offers lots of well-balanced classes that will help improve your stability and boost your equilibrium. They’re designed for all ages, all levels of fitness and all ranges of flexibility. This is a military-style fitness class that involves plyometric, high intensity intervals, strength training, cardio, core/balance works, various types of intense explosive routines and stretching for one fat-blasting good time. The benefits of doing ModuVated Boot Camp™ includes mental health, helps to reduce high blood pressure, hypertension and combat stress. The ModuVated team takes pride in providing the inspiration, variation and most importantly, the enjoyment factor to energize your workout. Be prepared for a total body transformation. A travel fee of $35 USD will be applied to San Jose & Puerto Los Cabos destinations. The Extreme ModuVated Boot Camp™ is an advanced military-style fitness class which involves weight resistance with props such as tires, sandbags, medicine balls, etc… It provides condition, strength and intensity. This class is highly recommended to those who really want a tough work-out. This class is a strength training workout that combines flexibility and cardiovascular conditioning using various tools and techniques to strengthen your entire body. With Body Sculpting™, you receive a cardiovascular and fat-burning workout and also help to prevent osteoporosis. It is designed to shape and tone the body without building muscular size or bulk. It is highly recommended for those enrolled in a weight loss program because it helps retain lean muscle tissue while boosting metabolism. Tabata is a high-intensity interval training (HIIT), also called High-Intensity Intermittent Exercise (HIIE) or sprint interval training (SIT). It is an enhanced form of cardiovascular interval training- an exercise strategy which involves alternating periods of short intense anaerobic exercise with less-intense recovery periods. Usual HIIT sessions may vary from 4–30 minutes. These short, intense workouts provide improved athletic capacity and condition, improved glucose metabolism, and improved fat burning. TRX is like no other piece of equipment you will find in your traditional gym. It’s great for those who want to develop lean muscle, build muscle mass, and lose weight. It may look easy, but it was developed within the U.S. Navy SEALS; TRX Suspension Training ™ will challenge your body in every way possible. It allows you to use your own body weight and gravity as resistance, functionally engaging your core and other major muscle groups involved in specific movements. This flexibility allows users of any fitness level to make progress because it puts you in control and allows you to safely increase and decrease the resistance. This is a fitness class which combines standing and floor exercises designed to target the gluts and core areas (front and back). You will leave with tighter abs, toned glutes and firmer legs. For those of us who love to travel but don’t want to sacrifice your workout, this class is for you. This fitness class involves simple functional exercises which combine high-intensity bursts, strength training, resistance bands and other techniques you can take with you on your trip. There’s more to strength training than just pumping iron. Resistance bands are simple, light-weight, universal training tools which strengthen neuromuscular structure where it is weakest. This class is designed to work every muscle group in combinations, especially to build muscle and tone the entire body. Resistance bands improve your balance, strengthen isolated muscle groups, prevent injuries and provide a self-controlled challenge. Spinning is a class which focuses in on endurance, strength, intervals, high intensity training all set to music to keep things fun! Some of the movements and positions will include hill climbs, sprints and sprint training which help to burn between 400-500 kcal in 45 minutes. Spinning strengthens the muscles of the lower and upper body, tones the quadriceps and hamstrings and works the triceps and biceps. Bikes are not provided. Zumba® is a global lifestyle brand that fuses Latin-inspired dance-fitness class attracting millions of fitness fanatics with a fun fusion of dance moves like Salsa, Merengue, Reggaeton, and Flamenco, and the sort of choreography you might see in a nightclub. Zumba® exercise classes are “fitness-parties " that blend upbeat world rhythms with easy-to-follow choreography, for a total-body workout that feels like a celebration. It combines fast and slow movements along with body weight training to help sculpt your body while having fun at the same time. MAT PILATES™ is a mind-body exercise routine which promises a longer, leaner body. Though the exercises may appear simple, they require complete stabilization of the torso and a focused effort to keep the abdominals contracted. The routine is performed on the ground using an exercise mat utilizing body weight alone or may include props such as foam rollers, resistance rings, balls and bands. This hour will focus on strengthening the muscles of the hips, back, abdominals, and glutes or what is known in Pilates as the ‘powerhouse’. Dynamic Hatha Yoga allows for the unfolding of beauty in all its forms through the classical techniques of yoga. This 60-min class focuses on everything from breath awareness, meditation, connection, alignment, flexibility, balance, relaxation, detox and even strength. The techniques are a dynamic flow of movement and stillness, which brings transformation at all levels- body, mind and spirit. We suggest having some yoga basics for experiencing this practice. This is a great opportunity to start improving your life. This class utilizes props to acquire the best balance and alignment. The practice has a rhythm which allows you to become your own teacher by accepting your limits and transcending them. During this 60-min practice, you will learn breathing and meditation techniques as well as flexibility/strengthening movements. Practice is always adjusted to the level of the student. All levels are welcome. If you are feeling you are not able to go through a whole yoga session or not comfortable with the idea, come try this class. You will improve your flexibility, energy levels, relieve lower back problems/neck/ shoulder tension, alleviate insomnia, reduce stress and restore your body. You will feel safe and stable with the use of supportive props, chairs, and working against the wall. Everyone is welcome. Please ask your Cabo Specialist for rates on groups 20+ for all activities.